The Gaiety Theatre began life as the Strand Musick Hall which opened on 17th October 1864 under the management of John Hollingshead, however, despite the popularity of the music halls during this period the strand Musick Hall soon went into liquidation. The original name suggested for the theatre was “Gaiete” after a trip to Paris by the owner Lionel Lawson but this eventually became The Gaiety, a name which spoke for itself, which promised much, was easy to remember and which struck a note to which the public would be bound to respond. The Gaiety Theatre had many firsts under the management of Hollingsworth, in 1878 it was the first theatre to be lit with electric light, it was the first English theatre in which a play by Ibsen was performed and where the first joint work by Gilbert and Sullivan was performed. It was a period when burlesque, farce, comedy and drama shared the stage. 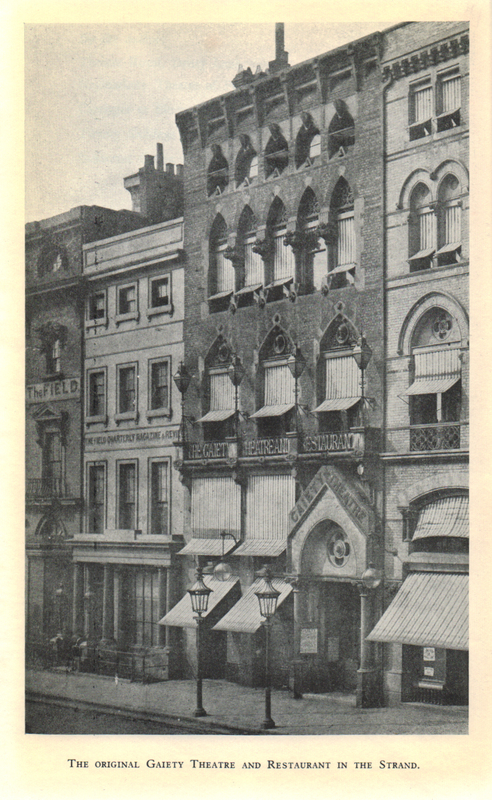 When in 1886 Hollingshead sold his interest in the Gaiety to Mr George Edwardes, to help pay debts incurred “in outside theatrical speculations” he was able to boast that during the previous seventeen years the Gaiety had only been closed for a total of eighteen weeks, a record at the time no other theatre in London could match. Tastes and fashions were changing and the days of burlesque were drawing to a close, musical comedy was on the rise and was born and flourished at the Gaiety. Under the management of Edwardes there were no longer the lavish displays of feminine limbs and charms, skirts replaced tights, and mystery, deep, alluring and irresistibility surrounded the female form. Edwards dressed them with perfection and taste which attracted not only the gaze of men but also women who gazed at their frocks. Although the comedians and comediennes were the stars, Edwardes put the “Girl” into the Gaiety, and so the “Gaiety Girl” was created and remains as famous as the theatre itself. Although the Gaiety under Edwardes continued to be packed nightly the neighbourhood was changing, the old streets going back to Tudor days were being pulled down leaving an area of devastation. A new Gaiety was commissioned, a new site near the Aldwych end of the strand. Its structure was different to the original Gaiety Theatre and was nicknamed “the pepper pot”. The final curtain fell on the old Gaiety on 4th July 1903 and a new curtain arose on 26th October of the same year; the date had been moved to the Monday rather than the planned Tuesday 27th to “suit Royal convenience“. The weather may not have been favourable but it didn’t deter the patrons who waited patiently for hours in the downpour, eager to see the Gaiety “reborn”. King Edward v11 and Queen Alexandra were amongst the guests; it had been his favourite when he was Prince of Wales and continued to be his favourite theatre when he became King. The public were not to be disappointed with the New Gaiety, it may have changed its clothes but the atmosphere was the same, it had the same romance, the same allure and sparkle, nothing had been lost or damaged in transit. 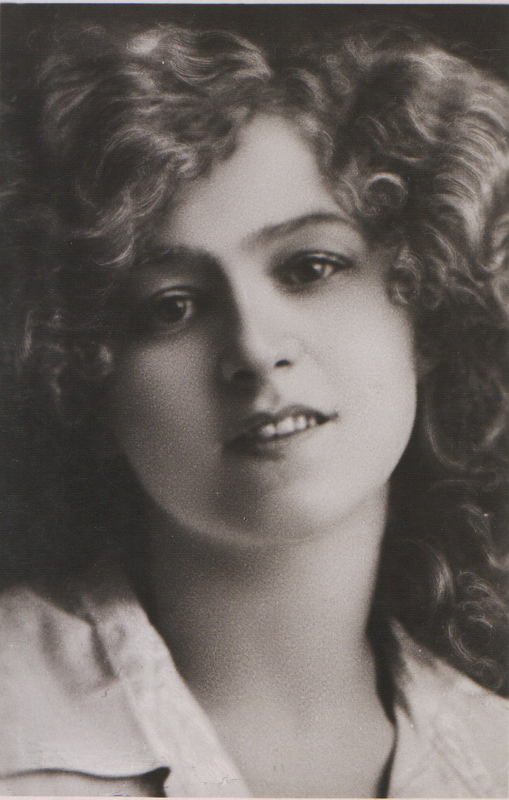 The New Gaiety opened with “The Orchid” which ran for 559 performances and introduced an unknown Miss Gabrielle Ray in the role of Thisbe, and as Macqueen-Pope wrote “A new Gaiety star was born”. The period from The Orchid to the outbreak of World War 1 was perhaps the height of the Gaiety and the Gaiety Girls; however, the dark clouds which spread over Europe also affected the atmosphere of the Gaiety and although photos of the Gaiety Girls could be found in every foxhole in the frontline its heyday, much like the lost youth of that generation would soon be lost forever. Following the death of George Edwardes on 4th October 1915 the Gaiety Theatre continued to entertain audiences until the final curtain on 25th February 1938. This was the 207th performance of “Running Riot” and was performed to a theatre “packed to suffocation.” Unlike thirty-five year before they were only saying farewell to a building which although had been filled with many happy memories would soon rise in the form of the New Gaiety; but this was the end of an era. Despite hopes that the Gaiety would be rebuilt and so continue to entertain a new generation of theatre goers structural problems made this uneconomic and the Gaiety was finally demolished in 1956. Macqueen-Pope wrote of the Gaiety, “the Gaiety always had Youth – and whatever your age, whatever your state of personal repair, you felt young when you enter it. That was one of its great secrets. More than any other in London’s many playhouses, the Gaiety was the Theatre of Enchantment”. Hollingshead, J; (1903) “Good Old Gaiety, An Historiette and Remembrance”, The Gaiety Theatre Company Ltd; London. Macqueen-Pope, W. (1947) “Carriages at Eleven – The story of the Edwardian Theatre”, Hutchinson & Co. Ltd; London. Macqueen-Pope, W: (1949) “Gaiety Theatre of Enchantment, W. H. Allen, London. Rouse, M; (1980) “The New Gaiety Theatre”, Picture Postcard Monthly, Reflections of a Bygone Age, October 1980, p 14 – 15.